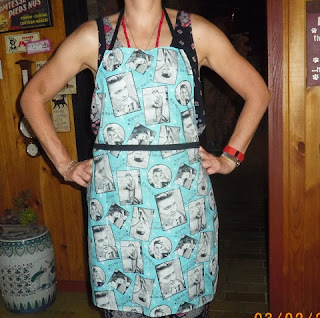 Patra's Embroidered Aprons: Home made apron for an internet forum swap. Home made apron for an internet forum swap. I belong to a forum where there are a number of members who love all kinds of craft, and the moderators organise swaps from time to time. Last month they invited members to make a dishcloth or an apron for their swap partner and as I don't knit or crochet, I chose to make an apron. 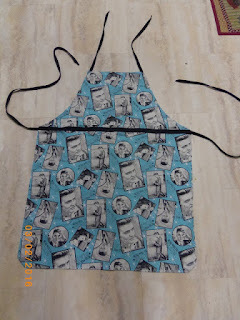 My partner is an Elvis fan, and as I have a heap of Elvis themed fabric in my stash, it wasn't difficult to find a piece the right length to make an apron! I made a template from one of my own aprons, and made the neck and waist ties extra long so the recipient has more than enough to tie it on, regardless of her size. As she is on the other side of the world, I have never met her, so the apron size had to be flexible! One of my friends modelled it for the photo before I sent it off to the U.K.